Without any doubt, The Win/Place Parlay is the most promising, yet least understood, profit opportunity at the race track. With this method, it is possible to enjoy boxcar profits in just one afternoon! Accomplished handicappers will discover this method to be a low-risk, high-reward approach to race track wagering. Cashing a place ticket for $3.80 is nothing unusual. In fact, the average place ticket at many tracks pays $4.00 or more. So, if you wager $40 on a place ticket and parlay your successful selections five consecutive times at $3.80 per winning ticket, how much money will you have at the end of the day? The answer is ... Almost $1,000 !! As a handicapper, can you consistently identify a PLACE horse in any selected race Seven times in a row? You don't think so? How about six? Maybe not? How about five? If you can do it three or four times, this approach could be a potential money-making opportunity for you. Of course, you are not necessarily looking for the "next Secretariat" in each contest, but you need to be consistently correct as a handicapper. If you are an experienced and confident handicapper, this money-making approach is for you! How many handicappers are capable of identifying a WIN or PLACE horse (let's call it a "key horse") in at least three consecutive races? Can you? Many Winning at the Track handicappers can! If so, The Win/Place Parlay could become a permanent tool in your handicapping arsenal! 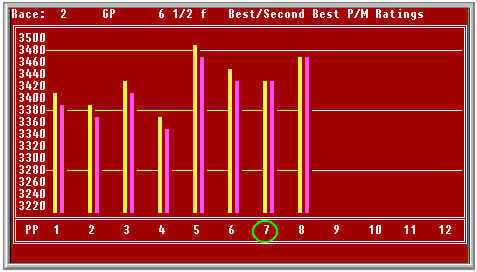 Graphics Screen Four helps users identify STICKOUTS in a race. In the contest illustrated above, the winner was Kings Antics (#4). Kings Antics (#7) failed to win this contest. The victors were #5 and #8. The program clearly displays the relative capabilities of all the horses. This unique program displays the highest "percent-of-requirements-met" for a single horse in each race. 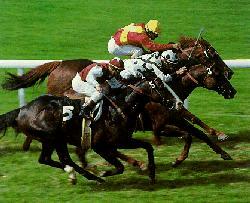 And, as indicated earlier, the key horse is usually among the top P/M-rated contenders in Winning at the Track. Once the requirements are set, the program helps you make the final decision -- without entering any new data. Also, the selection file can be changed at any time and different files can be created for different tracks.